I’m looking forward to the day, soon, when I can search Google for “open standards activist” and not find a paid Microsoft shill among the listings on the first page. In yesterday’s last roundup we also mentioned Malaysia, not just that “European standards expert”, who is actually a Microsoft lobbyist (quite newly-appointed in fact). It all comes together now. Malaysia married the words of that so-called "standard expert", who does a lot of legwork nowadays. I dont know what the attraction is, but somehow we all love the morbid fascination of Zombies in action. First, Microsoft^H^H^H^H^HCompTIA hires Mr Jan van der Beld, Ex-Ecma Secretary General, to fly all the way here in KL, for an event supposedly about “good multiple standards”. There he challenges us to find a better way to Fast Track large, immature vendor dependent specifications. The answer is of course: “Don’t do it.” Later on that same day, like a man possessed, he turns up at a PIKOM meeting only to rant and thump tables. Then today, in our fantastic broadsheet turned tabloid “The New Straits Times” features a “Comment” by our so called “cooler head” Datuk Dr Mohd Ariffin Aton entitled “Walking the Talk on neutrality policy”. If you’ve forgotten about him, you may be forgiven, but he is or rather WAS the CEO if SIRIM Bhd. It’s rather fascinating how far Microsoft has gone in its recruitment of voices. It’s truly like seeing a highly-polished propaganda machine. Those who are not in Microsoft’s pocket (or blinded by those who are) still hold a very consistent stance. 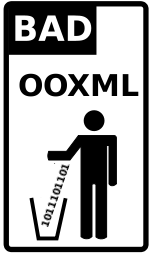 If the discussion on OOXML was purely technical I don’t think there would be much debate. Apart from Microsoft employees and a few lost souls, for whom we can only wonder about their real motivations, I have yet to meet any technical person arguing that OOXML is a good specification. What Microsoft has achieved here is a textbook example of a Big Lie, a case of manufacturing consent. Microsoft is buying the perception that a naked emperor is no longer so naked. That, along with factors like ballot-stuffing, has people truly believe that they vote in favour of something good. For those curious enough about the situation at the moment, Peter Judge has published somewhat of an overview based on Ditesh's research. Lobbying has intensified ahead of Saturday, 29 March, the deadline for Microsoft to convince the world that its Office Open XML specification should be accepted as a formal standard. The specification is still short of the two-thirds majority required in a vote of national standards bodies on whether to approve Office Open XML (OOXML) as an International Organization for Standardization (ISO) standard.